About 3:00 pm 12/25/08 here in Wichita, Ks my wife and I saw this phenomenon while walking our pom. The effect was very pronounced through our sun glasses and was so faint without them that we may not have noticed it otherwise. The colors were so dramatic they looked so surreal and lasted for about 15 – 20 minutes. The most prominent at first were the reds and oranges turning to bright yellow with greens blue and purple, unbelievable. This is the first time we have ever seen this phenomenon making this a very special Christmas Day. I saw this happen yesterday in Sharon Center, Ohio… it was like nothing i have ever seen before! 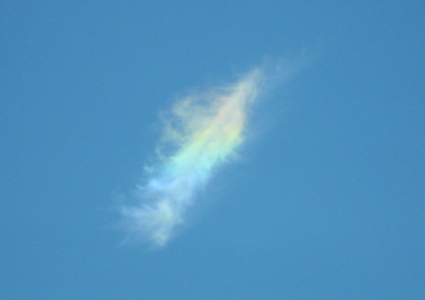 We saw a rainbow like this while riding a motorcycle down a country road outside of Marysville Ohio on August 7. It was beautiful and very large. we pulled over to take a photo. I couldn’t get a decent picture this time, but I saw another very faint fragment of this arc today. This time the sky was really hazy, but again a wisp of cloud was drifting at just the right position. When I got back to work and got out of the car, there was also a nice, full-circle halo. I did get pictures of that, which I’ll post tonight if I have time. Edit: here it is. If it was beside the sun, it was probably a sundog.